The Oracle/NetSuite deal means a big payday for billionaire Larry Ellison. Oracle will buy NetSuite for about $9.3 billion, in a deal that gives it a bigger share in the fast-growing cloud computing business and also means a big payday for billionaire Larry Ellison. In addition to being Oracle's executive chairman, entities Ellison beneficially owns hold about 40% of NetSuite's shares as of February, according to a regulatory filing. These would be worth about $3.5 billion if the deal closes. Corporate governance consultants said his links to both companies would increase scrutiny of the deal, but added its structure and strategic sense for Oracle meant it would likely pass. "People care [about governance] when someone makes the wrong decision," said Kevin McManus, vice-president of Egan-Jones Proxy Services. "But if the merger makes sense for the market, it's going to be hard to complain too much." NetSuite shares closed up about 18% at $108.41, just shy of the offer price of $109 a share in cash. Oracle shares rose 0.6% at $41.19. "It's definitely pricey from Oracle's perspective, but it's understandable and it's justifiable especially in this environment," said Morningstar analyst Rodney Nelson, who noted some companies in the sector have sold for high multiples. Oracle and NetSuite both offer software applications that help companies automate back-end and administrative operations from technology to human resources. NetSuite chief executive Zach Nelson was responsible for Oracle's global marketing from 1996 to 1998. 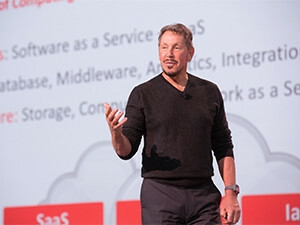 Oracle's cloud business, which stores enterprise software and data on remote servers, lets the company sell to clients who lack the budget for on-site hardware and technology staff. Like rivals SAP, Amazon.com and Microsoft, Oracle has focused on moving its business toward the cloud-computing model as sales of traditional software licences struggle. The deal could also help Oracle, which is aggressively trying to build and sell more cloud-based business software, play catch up with competitors such as Workday and Salesforce.com that specialise in cloud-based offerings. NetSuite reported strong second-quarter results, with revenue up 30% on the year and adjusted net income that beat estimates. Jefferies analysts said in a note the deal provides an immediate, significant entry into the mid-market for corporate applications but that "the price paid seems steep". Oracle has also acquired companies such as Textura and Opower to increase its competitiveness in the cloud market. Morningstar's Nelson said NetSuite would be Oracle's largest purchase since PeopleSoft more than a decade ago. The company expects the deal to add to its adjusted earnings in the first full fiscal year after it closes. Oracle said the evaluation and negotiation of the deal was led by a committee of independent directors. Closing is conditional on investors tendering a majority of the NetSuite shares not owned by executive officers, directors or people affiliated with Ellison and his family. Analysts said this structure was used to address the governance issue and increase the likelihood of its approval. "A regulatory review and shareholder lawsuits are likely given the family's ownership stake. However, we don't view these as material risks to the transaction going through," BTIG analyst Joel Fishbein wrote in a note to clients. Paul Hodgson, an independent governance consultant, said a factor in the governance debate is whether Oracle overpaid. "If it did, then that is a conflict of interest. If it paid what the market considers a fair price, then it's fine," he said. Because Ellison's ownership is all the public domain, the issue in unlikely to be a holdup for the transaction, said Peter Bible, chief risk officer at EisnerAmper Accountants and Advisors.